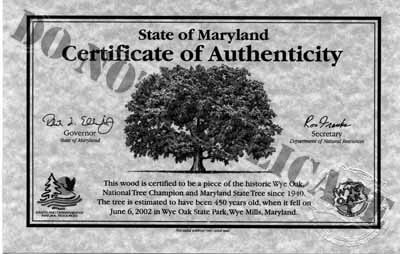 What would be more appropriate than to adorn your Holiday Christmas tree with an heirloom ornament made from the Maryland Wye Oak, our beloved State Tree. These Wye Oak Christmas tree ornaments are styled after a collection of Nineteenth Century brass sleigh bells seen in a New England folk museum many years ago. The bells are matte-finished with just a slight gloss using our standard four coats of tung oil varnish. A gold-plated filigree cap adds the final touch. Total height, ~ 2 1/4", dia. ~ 1 1/8". These ornaments make a perfect Wye Oak holiday gift for friends and family. Each Wye Oak Christmas Bell is unique. If the one you choose has already been sold, we will make a substitution of one that is closest in style to the one you selected. These bells go quickly, but we will be making more right up to the last possible delivery date for the holiday. Order before 12/15 to assure delivery before Christmas Day. As with all of our Wye Oak pieces, each Wye Oak holiday ornament comes with a signed copy of our Certificate of Authenticity. Note: If you happen to get tree sap on your ornament (these things happen), the sap can be removed with a soft paper towel dampened with lighter fluid. Then restore the matte finish with a light coat of a good, hard paste wax (hardwood floor wax, NOT any of those spray waxes!) and gentle buffing with a soft cloth.